LG HT904TA home theatre system features 5.1 surround sound, full HD up-scaling, Virtual Sound Matrix (VSM), Dolby Digital Pro-Logic II, iPod connectivity, 1000W total power capacity, etc. LG HT904TA is one generation behind the LG HT964TZ home theatre system. 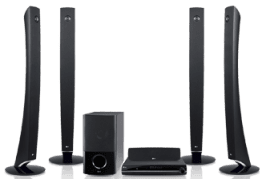 LG HT904TA has six speaker sets, consisting of four tallboy speakers, which will normally be mounted at the four corners of the sitting room, two for the front side and the other two for the rear side of the room. Each of the tallboy speakers delivers 155W. LG HT904TA also features a 225W subwoofer and a 155W centre speaker completing the speaker set. The speakers have a combined output capacity of 1000w. LG HT904TA home theatre system features Virtual Sound Matrix (VSM) which enhances your listening experience. VSM combines with Dolby Digital Pro-Logic II to give you a superior sound quality. Whether you are watching movies, sports, TV, or games, your LG home theatre will deliver. The SimpLink feature enables you control devices connected via HDMI or AV using just your LG home theatre remote control. LG HT904TA home theatre system features a multimedia/DVD player. Supported formats include DVD RAM, DVD +RW/+R, DVD -RW/-R, VCD/SVCD, CD -R/-RW, Audio CD, Divx, WMA, mp3, MPEG4, and JPEG. LG HT904TA home theatre system also features iPod and iPhone connectivity, which enables you listen to music stored on your iPod or iPhone with the superior sound quality of your LG Home theatre system. You can also charge your iPod and iPhone with the LG HT904TA home theatre. LG HT904TA home theatre system comes with full HD up-scaling which automatically converts standard definition SD content from your DVD or TV broadcast to high definition HD signals that delivers breathtaking pictures on your HDTV. This means that while watching your DVD on an HDTV, you will enjoy brilliant HD pictures. 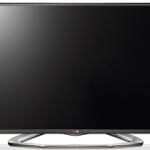 Like most entertainment centres, LG HT904TA does not include a TV. Therefore, if you need a television, you should have a separate budget for a TV preferably a full HDTV like the LG Borderless LED/LCD HDTVs or LG Scarlet LCD HDTV series. LG HT904TA home theatre system has numerous connectivity options like HDMI, S-Video out, AV out, component out, Aux in, portable in, and iPod connectivity. LG HT904TA home theatre is available at all LG authorised electronics dealer shops in Nigeria. Fouani Nig Ltd is the major authorised LG electronics distributor in the country. Catch a glimpse of LG HT904TA home entertainment centre at all Fouani showrooms and other authorised LG dealer shops.